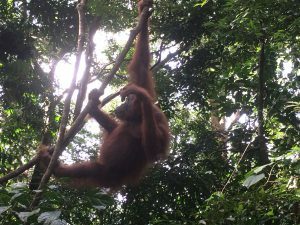 Whilst in Indonesia at Christmas 2016 I had the most amazing opportunity to see wild Orang-utans in their natural environment. There wasn’t much information on how to see them, I had to piece it together from a variety of sources. 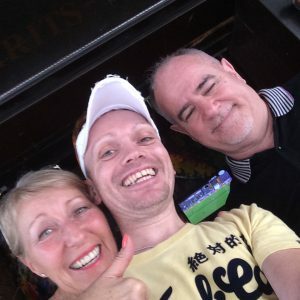 I’m going to write here a guide to how I did it in the hope that it may be useful for someone else to get the same amazing opportunity I had. I hadn’t planned to see them at all. My Plan had been to go to Bali for a few days to relax then head to the Gili Islands and from there catch a boat that Island hopped over a few days down to Komodo to see the Komodo dragons. Trying to do this in December in the rainy season wasn’t the best plan. The sea was rougher than I had anticipated and the harbour Master wasn’t allowing these boats to travel. 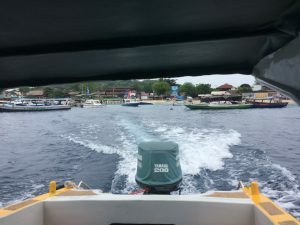 I had found that even getting to the Gili islands from Bali had been difficult with all the fast boats being cancelled. I had to take a ferry to get there. With the tides as they were it took over 6 hours to travel from Bali to Nusa Tenggara Barat. From there I had an over land coach trip and a speed boat to get on the island. 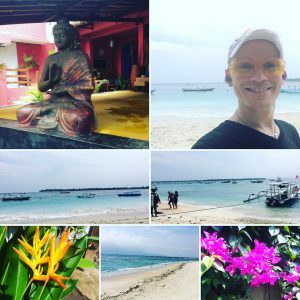 After spending a couple of days on Gili Trawangan and discovering that I couldn’t do the boat trip I had planned I had to come up with a new plan. At one of the tour shops there was a picture of an Orang-Utan, and I asked about them. I was told that Borneo was only one flight away. I was hoping that they would then try to sell me a deal to go and see them but that was about as much info as I could get out of them. Back at my hotel room I was able to do a bit of research online. To see Bornean Orang-Utans seemed to be quite difficult with some places needing a 4 day boat trip up river. Although this sounded amazing as a trip through the rainforest, I didn’t have the time whilst I was there. 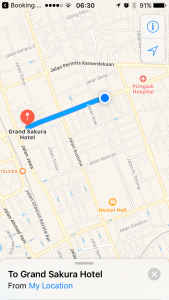 Especially after taking 16 hours to do what should have been a 2 ½ hour trip to the Gili Islands, I was worried what I might not make it back to get home if things took a bit longer than expected. In my research I found that there is a sub species or orang-utan in Sumatra. I had flown over Sumatra on the way to Bali and had noticed the rainforest from the air. It seemed a more viable option. In order to do this I had to get to the city of Medan. This is the capital of Sumatra. It’s at this point I should say that I was travelling around on my own and didn’t always make the best decisions or the cheapest ones maybe you can learn from my mistakes. I was quite often flying by the seat of my pants and making decisions on the hoof. With more planning it could be cheaper. When booking flights I generally use SkyScanner they have an easy to use app on the phone that shows you a number of options from different companies. It also has a handy button that screen shots information too. I learnt the earlier you book flights the cheaper they are, so a bit of forward planning is probably a good thing. When booking hotels I used Booking.com on their app as it allows you to see different hotels with different sort filters and maps for locations. On that point of forward planning. Here is the first mistake I made. I had decided to get to the airport from Gili T. I thought I had seen transfers available from the tour operators at the town centre. I thought they left at 8:30am. They didn’t. They left at 8am. This was my first costly mistake. Go the night before and check exactly what time things are happening book it if needs be, and use your phone to take a picture of the time so you know what you are doing. I could have waited till the afternoon to get the next transfer to the airport. But instead I took the option of having a private transfer. I could leave there and then on a speedboat and have a taxi waiting to take me to the airport and I paid it all in one go before I left. This obviously cost more but got me to the airport earlier and had the convenience of being in an air con car on my own. I hadn’t booked a flight as I had no idea what time I would make it to the airport. 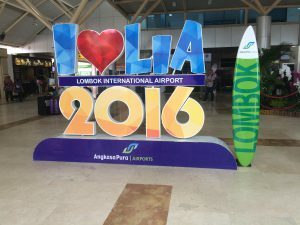 When I got to Lombok airport I was able to look up flights to Medan. There are no direct flights there. Each one had a transfer. 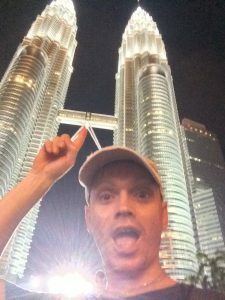 The next one would go via Kuala Lumpur in Malaysia so I decided to go there and stay for a night. Because the flight was with in 3 hours I couldn’t book on line I had to do this at the airport. Again this is a more expensive way to do it, but no more difficult than getting a train ticket at a railway station. If booking at the airport I noticed I was charged for insurance as well if you are away you probably would have insurance already so might be worth saying that you do. 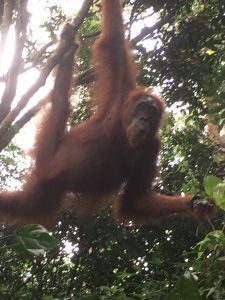 I know this next bit isn’t anything to do with going to see Orang-utans so if you want to skip to the Medan title it will take out my night in Malaysia, but if you were thinking of doing this too ill add some details here. I flew with Air Asia which was pleasant and clean, Similar to EasyJet in the UK. 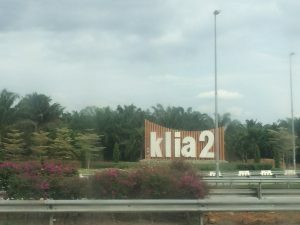 Kuala Lumpur airport has a rather large shopping centre attached to it. I found a burger king and grabbed some food and hopped on their free wifi. 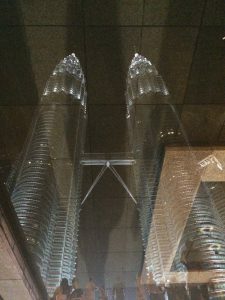 I wanted to see the twin Petronus towers whilst I was there. Using the booking.com app I found a hotel/hostel that wasn’t too far to walk from the towers but also close to a bus and train station. 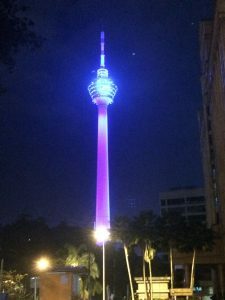 I stayed at the hotel Pudu 88 which was a couple of minutes walk from Pudu Sentral coach station. Me being me got lost trying to find it when all I had to do was cross over the road and walk down the road about 500 meters. Pudu Sentral coach station has a direct coach from the airport for RM12.00 which is about £2 (dec 2016 exchange rate)and leave every half hour. Here’s another bit of advice when travelling to another city to save your data on your phone download a city map app that can be used off line it helps so much and I would also have a power bank to as these apps drain your battery. I bought a solar powered power bank that I just hang off my back pack and charge whilst walking around. The hotel was clean, but very simple and very tired and dated but then that reflected in the low price I paid for it. It was about 20 mins walk from the towers. Which were amazing to go and see. Loads of bars and restaurants around there to grab a bite or a drink. 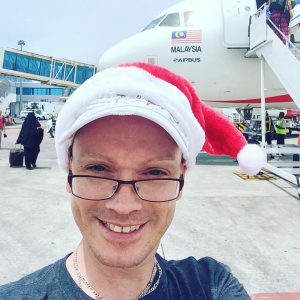 I landed in Kuala Lumpur on Christmas Eve and had the fortune of being able to meet up with a family friend and work colleague on Christmas day in China Town for a drink before heading back to the airport. This was really nice as I was travelling on my own. Again buses go directly to the airport every half an hour from Pudu Sentral you just have to find the guy sitting at the plastic table by the bus stand for your ticket. 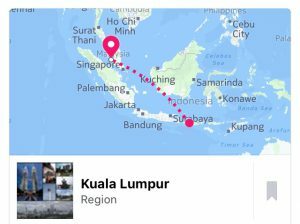 Once there I booked another Air Asia ticket to Medan. Amusingly when I got on the plane I had the same guy as the head of the cabin staff from the day before. Always nice to be recognised. There is a train that takes you from the airport to the centre of the business district in Medan. Kualanamu train station is directly opposite centre point shopping mall. Which is quite impressively lit if you arrive at night and has a food hall on the lower ground floor with restaurants from the the big chains such as Pizza hut and KFC. Filled with your usual malls shops if you like that sort of thing. I booked the Grand Sakura hotel. I really liked this hotel, especially after the last hotel I stayed in this felt like luxury to me and for just a few pounds more. I chose this hotel for a number of reasons. 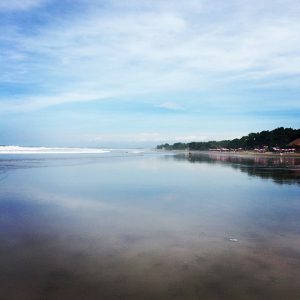 Its proximity to the train station, its price and that it had a business centre that could sort out trips around Sumatra to different attractions. I learnt that you get a bigger discount to book this hotel through booking.com than by booking it direct with the hotel. I had booked one night but when I wanted more reception told me it was cheaper to book through booking.com I think they only have one room on the site at a time from what I can figure out. This isn’t true of every hotel. Some its better to book one night and then you get it cheaper to stay longer with the hotel I had this at other hotels. Its worth checking your price on line before you do it in the hotel. The hotel is not on google maps or any other map where they say it is. Here is a map of where it says it is and where it actually is. (the pin is where google thinks it is the blue dot is where it actually is) It is a good 15-20 minute walk from the train station. I walked it and it is doable. Although there are not many paths and where there are paths there seems to be blocks of them missing so if doing this at night probably worth having a torch or using a flash light on the phone as where the path is missing it drops into a storm drain. Would be worth having mosquito replant on too! The hotel is 3 star but to me felt like more. Large room with queen size bed tv and ensuite with a large walk in powerful shower. Food is definitely Indonesian cuisine if you want western pop up the road to the centre point mall. I had the most interesting club sandwich ever in the hotel. The chicken was a boiled egg and I don’t know what the bacon was but it was pureed. Likewise breakfast is Indonesian. Lots of rice, fish stew and fairy bread although good coffee and fruit. 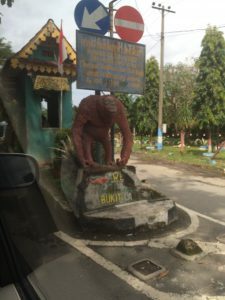 I had planned to go to Buckit Lawang and stay in a hotel there but when I found out I could do it in a day from the business centre I decided to come back to the hotel as I liked it and the hotel there sounded like they had little luxury, and being in the rainforest a lot of mosquitoes. At this point I was not feeling the love for Mosquitoes having been bitten more than I cared for. 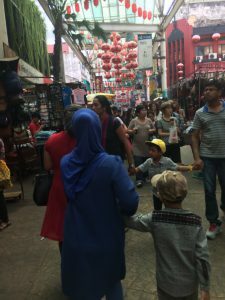 I had picked up special cream in Malaysia that I needed a prescription for as I was reacting quite badly to the bites. If I could avoid them I would. If you can book your trip at the business centre the day before so you have the driver turn up in the morning allowing you to make the most of it. I didn’t I booked it that morning and had to book another night in the hotel. Because of this lack of planning (have you noticed a theme yet? Plan better than I did, it cost me more a few times and more to come) the driver couldn’t get to me till 11 am. It cost me IDR 760,000 (£45) to have a private driver take me from the hotel to Bukit Lawang. I believe this is one price should you have a car full or just one person. If there are 2-4 of you this would split the cost. The driver was great. He spoke hardly any English but if you are a westerner when you see how they drive in Medan you’d rather they pay attention to the road. I believe there is one rule in city and that’s if you aren’t over taking you probably should be. Road lanes seem to be more guidelines that actually used and you haven’t experienced pot holes until you have done this trip. As you get further out of the city you will see many lorries coming from the palm nut plantations changing tires from them. 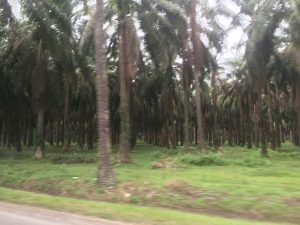 The palm oil industry is prevalent. As you leave the city that is almost all you see until you get to Bukit Lawang. Rows and rows of palm trees broken only by small villages. You become increasingly aware that the western lifestyle has done this. Just look up what palm oil is in you’ll be shocked. The drive is about 3 hours out of the city. Which is bearable. The driver takes you directly to the where you can get a guide to take you through the forest to see the orang-utans. From what I remember I paid about IDR1.500.000 (£90) there was a bit of bartering which I’m not very good at. Usually you would have a small group go with the guide. And you would pay a fee for 4 of you to go. Doing it alone I was obviously paying for 3 or 4 people. And I also added the trip back down the river on a raft (If you do this take a towel and a change of clothes and leave them with your driver as you will be soaked after). If you take my advice and get there early you can hook up with other people to have a group and make it cheaper. So I had a guide take me up in to the rainforest who was very informative about all of the plants and animals that are around. Pointing out lizards, that were so well camouflaged, that I would never have even seen them. 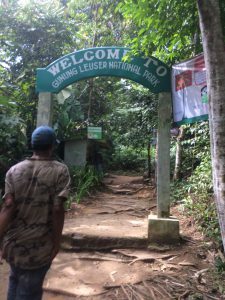 The price covered the entry into Gunung Leuser National Park. And within 15 minutes I was seeing wild Orang-utans. My guide had been doing is for 23 years and knew each of the Orang-utans by name and their history. I was so lucky each of these great apes have their own personalities like us. 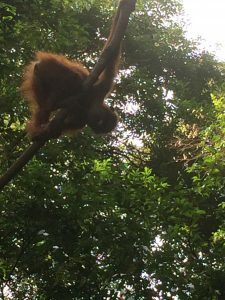 The first Orang-utan I saw was obviously not feeling too much of the love and was quite happy sitting high up in her tree. The next one actually came down no more than 10 meters away from me and literally posed for photos. Maybe I was just lucky or it was being just two people me and my guide she was happy to do it. 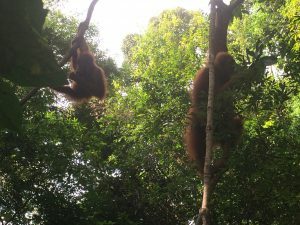 There were two babies also playing that came down as the mother Orang-utan came down. We stood and watch for such a long time that I almost ran my phone battery out (take a power bank you are going to need it). I saw 6 Orang-utans that day three adult females and three babies. One of the adults was literally laughing at us tourists. She was pulling faces at us till we pulled them back and then she would quite literally laugh in our faces. It was a magical experience. We then walked further through the rainforest until coming back to the river for the raft ride back to the base. When I say raft it was three giant inner tubes from lorries strung together with a rope net in the middle of them. They have a plastic bag for you to put your valuables in which is majorly water proof. My phone was already in a water proof pouch. I would recommend a water proof pouch when travelling anyway as they keep out sand and dirt and cost a few pounds on ebay. Better than a few hundred should you drop your phone or other electrical device in water. Alternatively when you get to the airport grab a couple of those bags that you have to put your liquids in for customs. They have a zip type lock on the top and would save too much extra worry. They would at least give you a bit of protection. Once on the raft I was told don’t worry it wont be long the river is fast today. Just want you want to hear as they push off with nothing more than just sticks and you are heading toward the rapids. At the end you are soaked your shoes are muddy. Id give your shoes a quick wash of in the river. Then if you paid attention to me earlier you’ll have a change of clothes and a towel back at the car. Rather than sitting for the tree hour journey back in wet underwear and trying to dry out your vest by hanging it out the car window lol. One great thing about staying at the hotel I did was that I could have an amazing hot powerful shower after and curl up in an air conditioned room with movie channels. Being boxing day I was also able to facetime my family and tell them all about my adventure. I stayed another day as some chill out time, before flying back to Bali ( A night longer and flights the next day was cheaper than trying to get flights after) it also allowed me to find times for trains (every half hour) back to the airport and to find the best time to get back, as well as a practice timing run to the train station. Whilst there I did some window shopping and had dinner in the centre point mall. 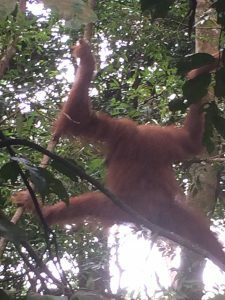 I hope this helps if you are looking at seeing Orang-utans in Sumatra. I’m sure you will have a great adventure of your own! RdGChI Thanks for sharing, this is a fantastic blog post.Much thanks again. Cool. ← How good is your diet? Are you a square box person?